Whether you put lipstick on daily to enhance your lips natural colour, or over-line the shape to create a fuller look- WUWMU can make a dramatic change to your daily makeup routine with one of our two different Semi Permanent Lip treatments. We offer either a simple Lip Liner enhancement to sharpen and even your natural shape, or a Lip Blush treatment which is perfect for the lady who wants a slightly more made up finish that shades the lip. We offer a vast selection of colours to ensure you find the tone that suits your personal preference. The first part of the process is a consultation. This is normally done as part of your initial treatment, but can be done separately if you prefer. A member of the WUWMU team will talk with you in great detail about the look you are trying to achieve and what we might recommend to you. This is very much a two-way conversation. We listen, we respond, we advise. Once we have an idea of the look you are aiming for, we draw the lips on. These can be drawn on and adjusted as many time necessary! We will never begin the Semi Permanent process until you are completely happy with how they look. Using a specialist facial tattooing machine, which works at a much lower frequency than a standard tattoo machine, we gently apply pigment to the lips using very fine needles. The sensation is that of a gentle electric toothbrush being held against your skin – you feel the vibrations but you should not feel any discomfort. We will always work with you at this stage to ensure your upmost comfort, giving you breaks if you require them. The process normally takes about two hours, but it varies from person to person depending on your individual requirements. Immediately after a treatment you should expect the area to look 40-50% more intense than the colour you have chosen in consultation. This will start to fade after 3-4 days. A second appointment is needed 8-10 weeks after your first treatment. This is usually a 90 minute appointment to add more pigment to the lip area. This is because as the area is healing, some parts may not ‘hold’ as well as others and you may have a few patches that need more colour. This is completely normal and everyone heals differently. Whatever the case, we advise you always come back to clinic for your retouch. 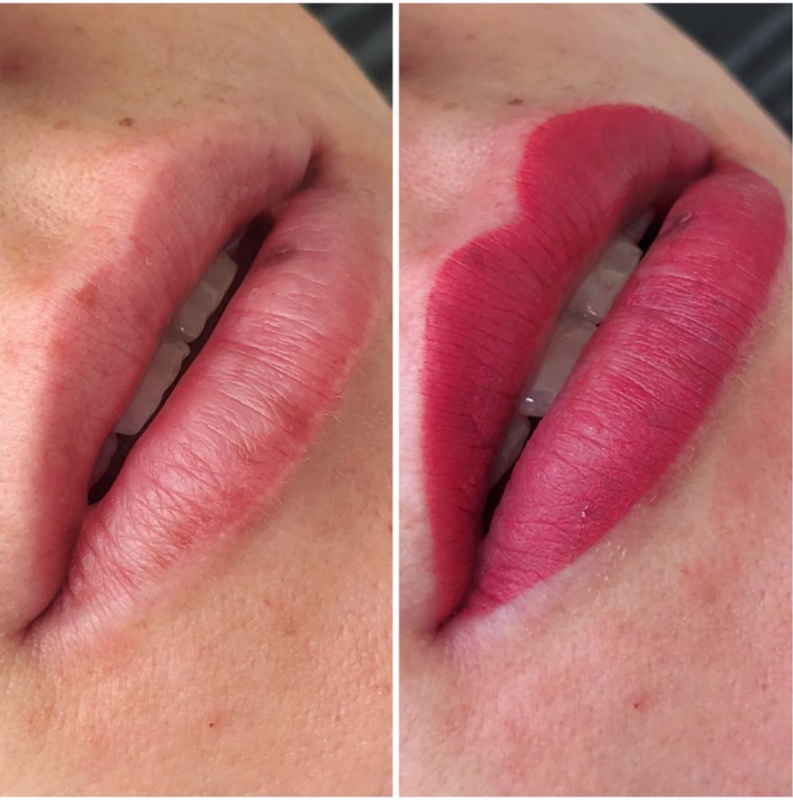 What is Semi Permanent Lip Liner and Lip Blush? 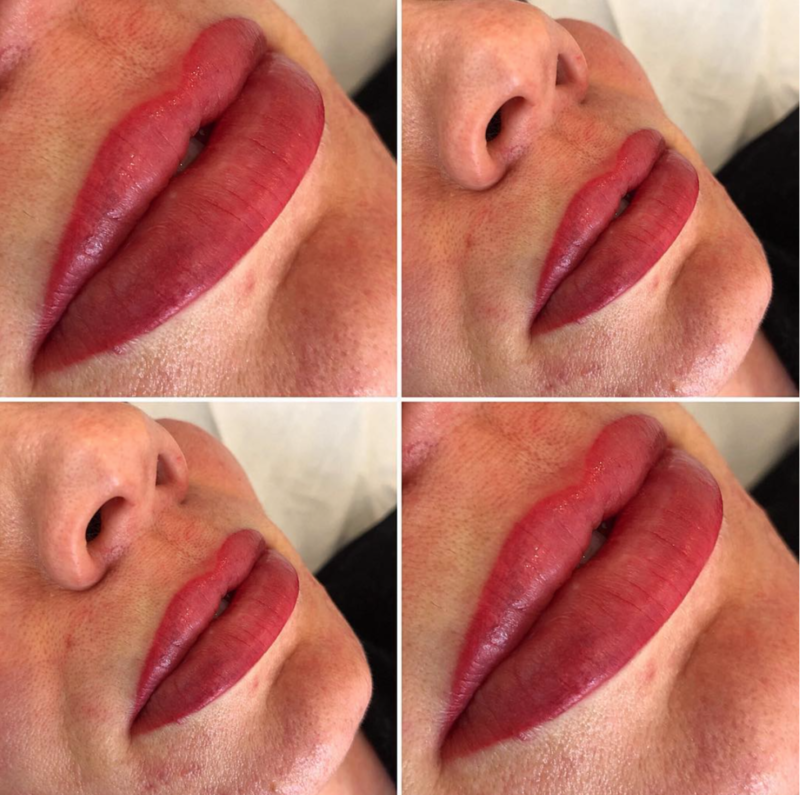 Semi Permanent Lip Liner is the procedure that enhances the contours and outer shape of the lip by recreating the definition of the edge of the lip. 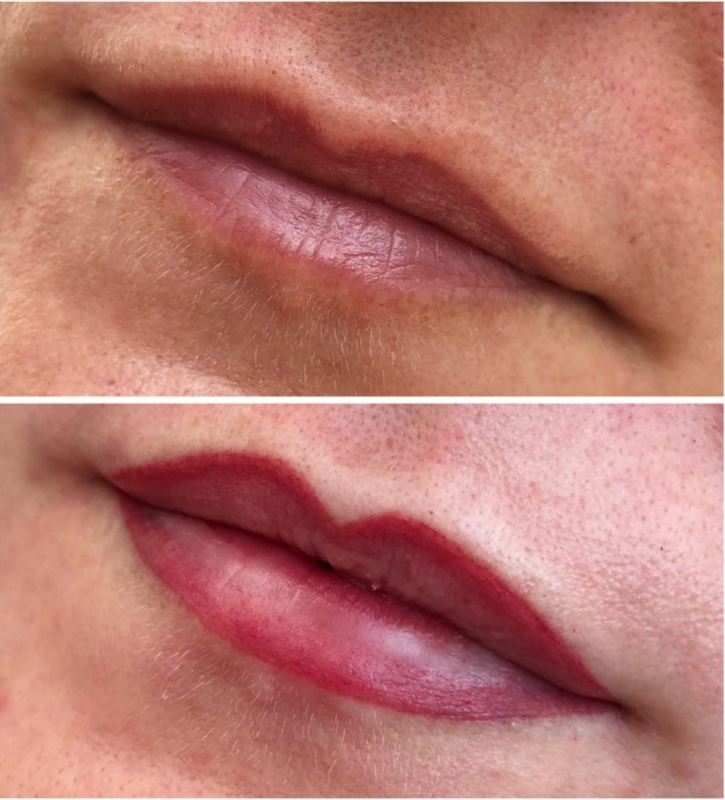 Semi Permanent Lip Blush is the procedure that whilst defining the outer shape of the lip, also gives you a shaded more prominent colour all over. It resembles how your lip would look if you were to apply lipstick all over. There is no right or wrong choice. 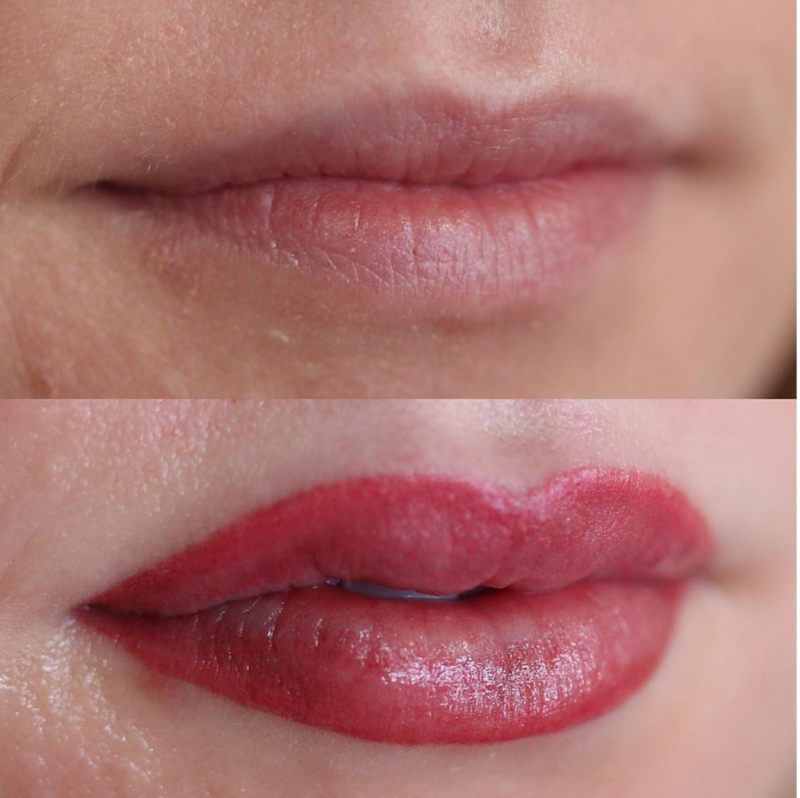 Which style of Lip Tattoo you have is entirely down to which look you would prefer. In short, No! You may feel a little discomfort from time to time, but we numb the lip and surrounding skin throughout the procedure and our priority is your upmost comfort.